For a month I had the opportunity to go to school at San Esteban, observe the classes, and meet really great friends and teachers. I enjoyed how in the morning the whole school would line up and raise the flag, it made me feel like San Esteban was very unified in their beliefs and actions which is different from my school because we always start the day with a class and only all gather together when there is school wide assembly. I also liked getting to experience a school with religion since my school has students with a wide range of ethnicities and religions. One of my favorite things about Argentina and San Esteban was the relaxed schedule. I liked how school started later at nine, ended at 5, and had many breaks throughout the day where we got to go outside and chat with friends or eat a snack. While Megan and I were at San Esteban we got to go hang out with a few kindergarten classes and answer questions and play with them which was really fun! They were so cute every time we came and gave us a card at the end of our trip which was really sweet! I felt very welcomed not only by the students in my grade but by the whole school at San Esteban because I got to talk to many other students of different ages too! 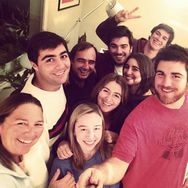 When I first arrived to Argentina I was very nervous but when I got to Julieta's house and met all of her friends and family they made me feel very included and I felt a lot better and excited about what was to come in the trip. Julieta's family took me to Córdoba so I got to experience a different part of Argentina. It was fun getting to see the mountains and pretty scenery while exploring different parks and areas. After a month I wanted to stay longer because of how great my experience had been so I got to stay a week later with Barbie's family which was really fun! I Barbie has 4 brothers and 1 sister so it was great to experience living in a family with lots of siblings because I'm an only child. While staying at Julieta and Barbie's houses I always felt at home and comfortable, they always made me feel like I was part of the family which was a really great feeling being in a foreign country. Thank you San Esteban for one of my best experiences ever. A fines del mes de junio y durante casi todo el mes de julio Kristen y yo tuvimos la oportunidad de vivir un intercambio en Buenos Aires. ¡Fue una experiencia increíble y esperamos que este intercambio continúe!